Isaac Liddle is keen to marry Emmie, and she knows she shouldn't hide her pregnancy from him any longer. But before she can tell him her secret, a widower friend asks the impossible of Emmie: Will she honor her promise to his dead wife by marrying him to care for the orphaned baby? With the Sioux Wars threatening outside the fort, Emmie's solemn vow threatens her happiness from within. 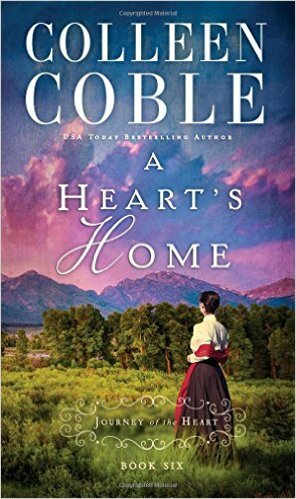 Will she honor a promise sure to break her heart---and Isaac's? Or is there another way to find a home for her heart? 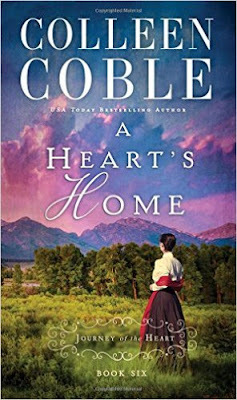 "A Heart's Home" is the sixth book in this novella series. This book really is the ending you wanted to see in this series. I absolutely loved all 6 books in this series & I have decided that I liked this book the best out of all of them. You get the ending you want. Is it happy ending for everyone? I'm not telling! lol You will just have to go and pick up the series to find out for yourself. I absolutely love Colleen's writing style. She definitely has a way with words.